On our last visit to Kansas City, my sister introduced us to this fabulous burger restaurant. 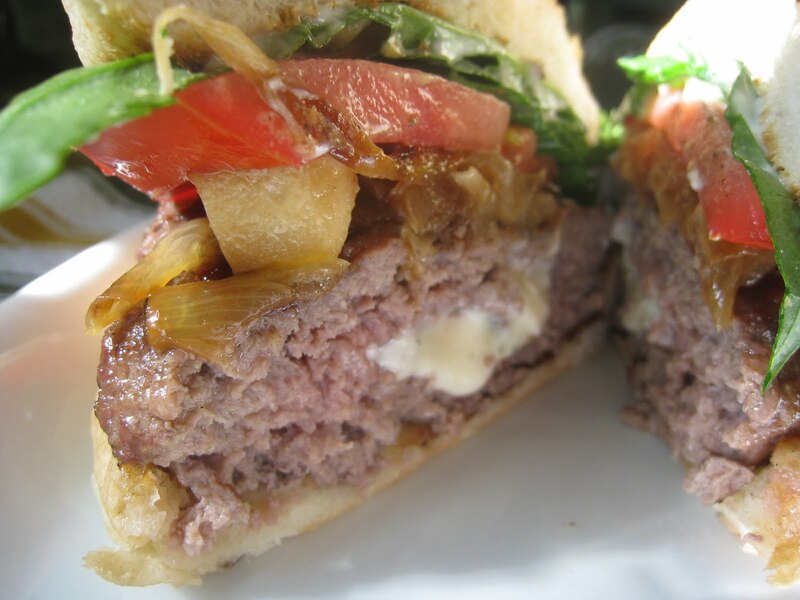 Food Network Magazine recently rated its inside out burger as the best in the state of Missouri. This burger has blue cheese stuffed inside, applewood smoked bacon, an onion ring, butter lettuce, ketchup, & mustard all served up on an onion brioche bun. I had a bite of my sister’s burger and it was divine. (I actually ordered the turkey burger and it was equally delicious!) We do not have anything nearly as cool where we live so I decided to recreate my own version of an inside out burger. I sauteed some onions and served it on top of the burger along with sliced tomato and spinach. Oh. my. goodness. This is why I cannot be a vegetarian. In a mixing bowl, combine beef, olive oil and salt and pepper. Do not overmix the beef mixture. Divide beef into four equal parts. Form each part into a patty. Insert one pat of blue cheese into the middle of each beef patty. Prepare a charcoal or stove-top grill. Cook for approximately 5-6 minutes per side for medium-well. Grill buns until toasted. Serve burgers with spinach, tomatoes and sauteed onions. Previous Post We’ll Always Have Paris! >Hey, Susy! I didn't know you had a recipie blog!!! This burger does look divine!!! We might have to try it soon!!! >Hey Kim,I think I may have started the blog when you were at THRBC. It's so much fun! >Krista,I'm sure it would work fine with ground turkey. Cooking times will be different since turkey is leaner and it may need some extra salt and pepper since turkey is so, well, blah. :) Let me know how it turns out!